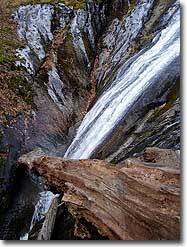 Crabtree Falls is one of the most beautiful waterfalls in Virginia, and certainly the tallest. 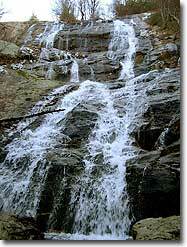 It is commonly referred to as the tallest waterfall in the East. This is a mistake because Crabtree Falls is actually a series of waterfalls, all beautiful and tall but not one distinct drop. Crabtree Creek flows from Crabtree Meadows through a rare hanging valley for this region before plunging 1,080 feet towards the Tye River. There are 3 distinct sections. The lowest section is the tallest and consists of many drops, the lowest right near the parking lot. The middle section is a single drop through a crevice surrounded by trees and moss, it is wildly different than the lowest section. 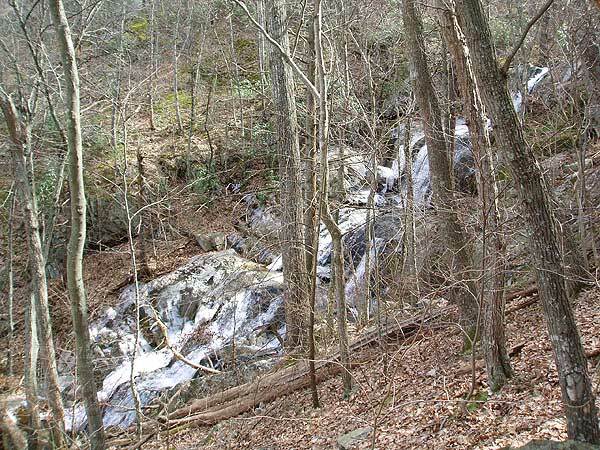 The upper waterfall is the largest single drop over a massive cliff. You could spend an entire day here taking pictures, soaking up the scenery, but there is so much more to explore. Beyond the upper waterfall the trail climbs through a hanging valley on its way to Crabtree Meadows. 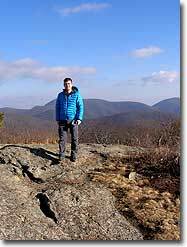 From the meadows it is a short hike to the Appalachian Trail where you can choose to hike to The Priest or Spy Rock. 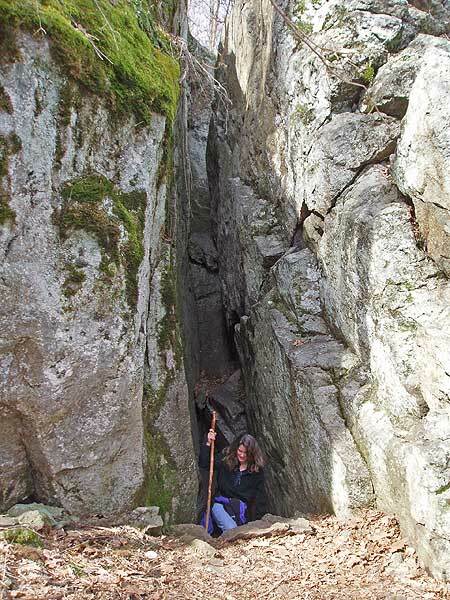 This hike takes you south on the Appalachian Trail to Spy Rock. Spy Rock is an incredible rock dome on the east side of Maintop Mountain with 360° views of the Religious Range, Mt. Pleasant, The Priest, Three Ridges and St. Mary’s Wilderness areas, and the eastern foothills. 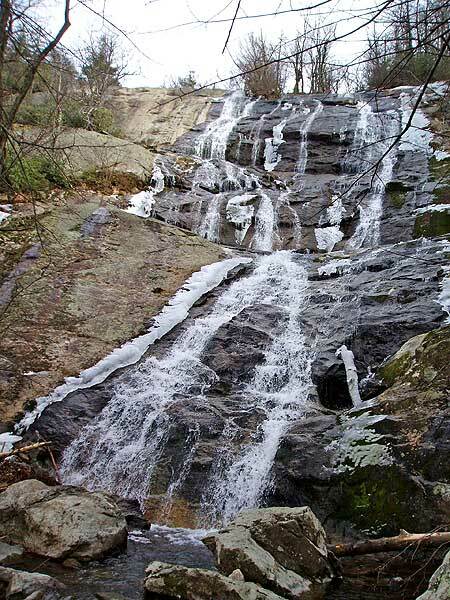 You can do Crabtree Falls and Spy Rock as separate short hikes or you can try this hike for a wonderful day combining waterfalls with incredible vistas. 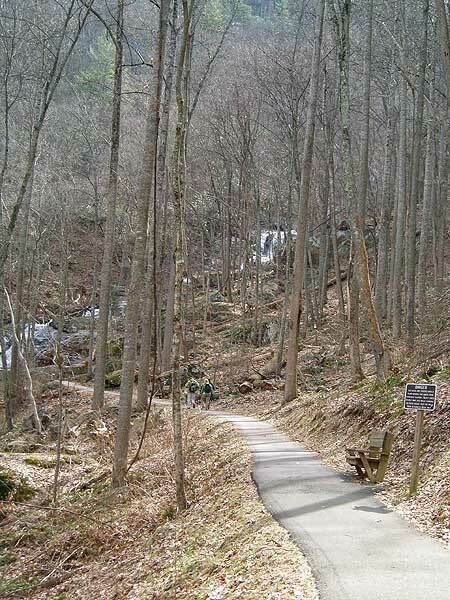 Mile 0.0 – Hike begins in the Crabtree Falls parking lot. Take the paved trail at the far left of the lot beside the information board. 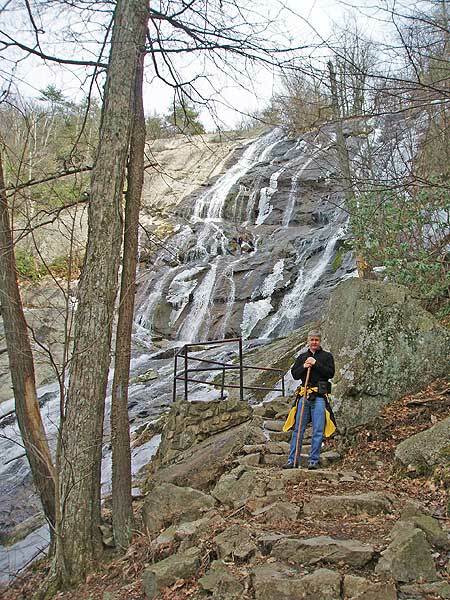 Mile 0.2 – Reach a viewing platform at the base of the lower section of Crabtree Falls. For the next 0.7-mi the trail switchbacks up the lower falls. The lower section consists of multiple drops totaling over 350 feet. 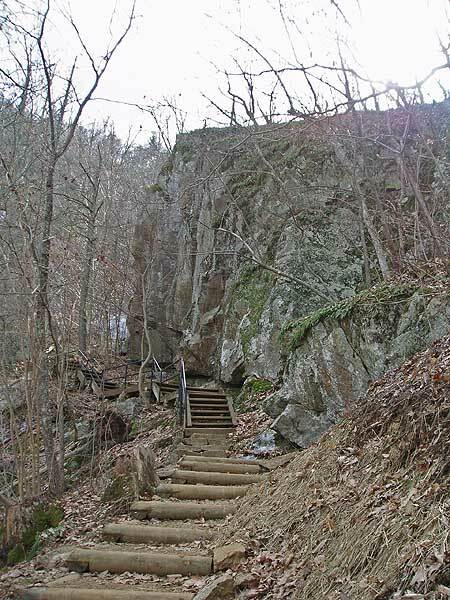 Mile 0.4 – The trail follows a large staircase below a boulder to the base of a beautiful drop. The water is funneled to the far left side of a cliff while the rest of the cliff is covered in moss and ice (in winter). 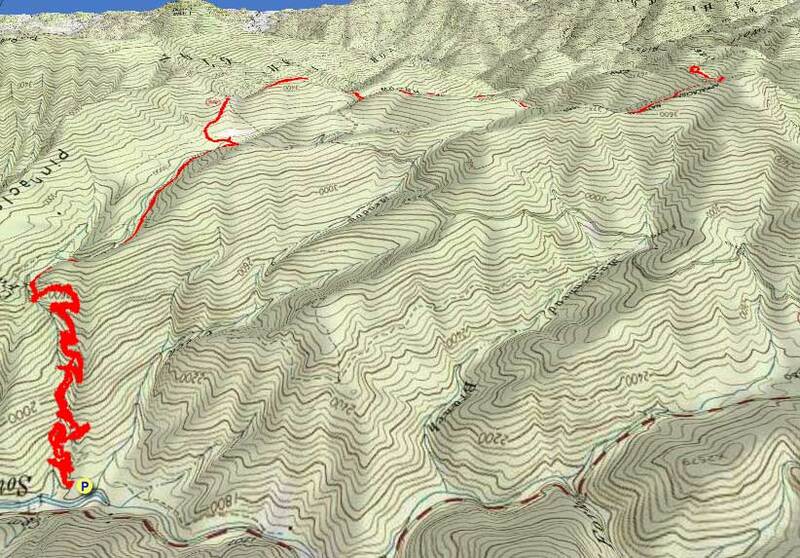 Mile 0.7 – Reach the largest drop of the lower section, well over 200 feet. 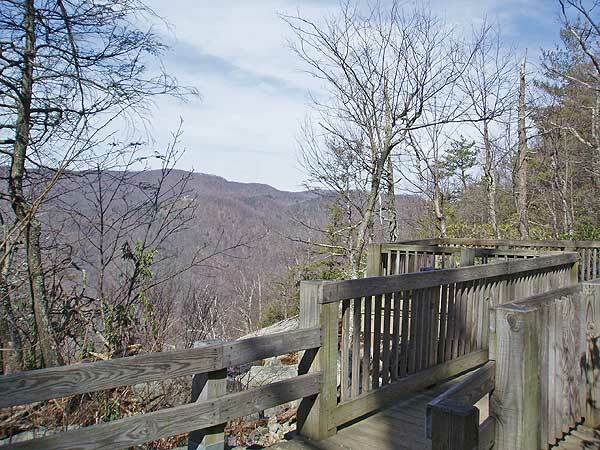 Mile 0.9 – After 0.7-mi of climbing the trail passes by an observation platform at the top of the lower falls. 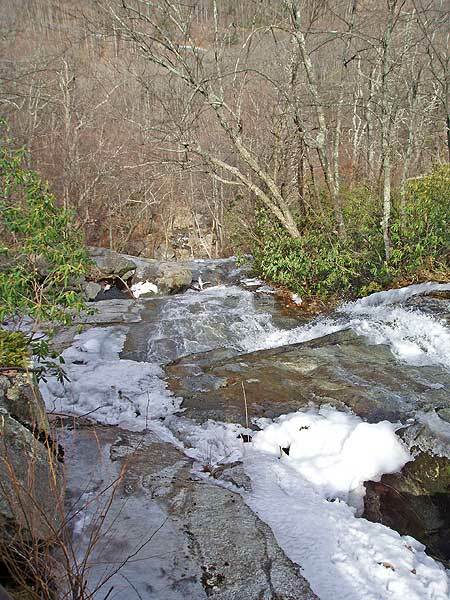 Crabtree Creek flattens out beyond this viewpoint on its way to the middle falls. There is a large cave on the right formed by fallen boulders. Mile 1.0 – The trail reaches the base of middle falls section. 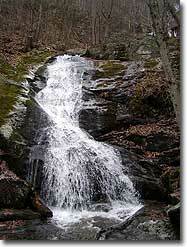 The middle falls is a single drop ~90 feet where the water flows through a moss-covered crevice near the bottom. 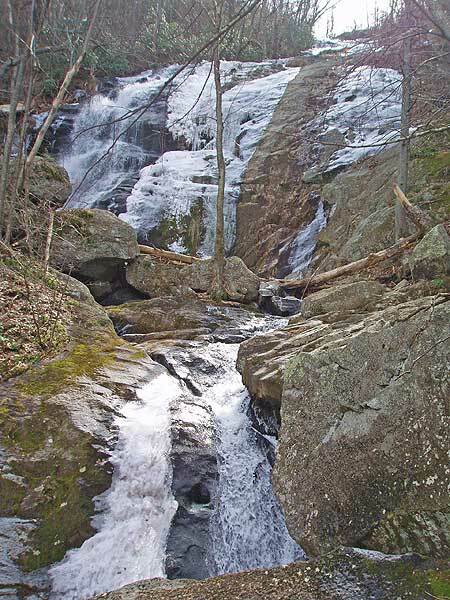 Mile 1.6 – Arrive at the base of the upper falls. 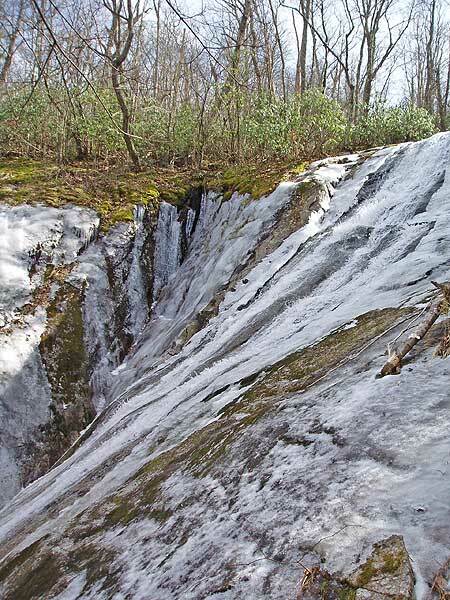 Crabtree Creek plunges over a towering cliff on a double drop over 200 feet high. 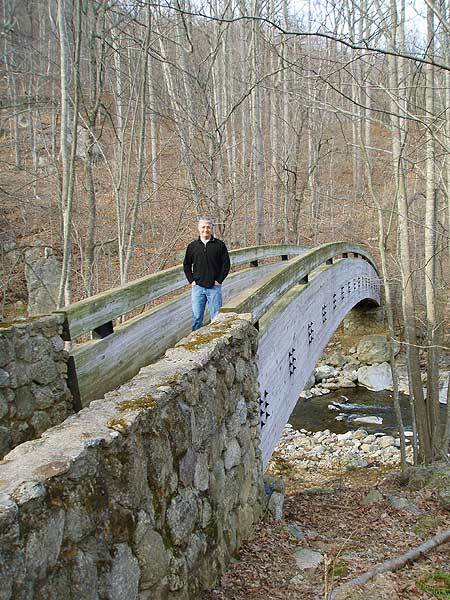 Mile 1.9 – Cross a wood bridge over Crabtree Creek at the top of the upper falls. 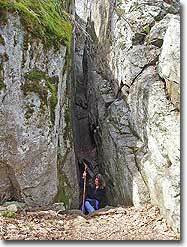 There is a long, stone wall guarding the viewing area from the vertical cliff. From here you can barely see the water flowing over the rock face, but there are great views of the Tye River Gorge. Do not stray beyond the wall, the rocks are covered with a very slippery algae, and according to the Forestry Service sign, many people have fallen to their deaths climbing out onto the rocks. To complete the 3.8 mile out/back Crabtree Falls hike only, return down the trail. If you are hiking the 13.9 mile Crabtree Falls/Spy Rock route continue with the directions below. Beyond the waterfalls the Crabtree Falls Trail follows Crabtree Creek for 1.4-mi through a hanging valley. There are many wonderful campsites beside the creek. 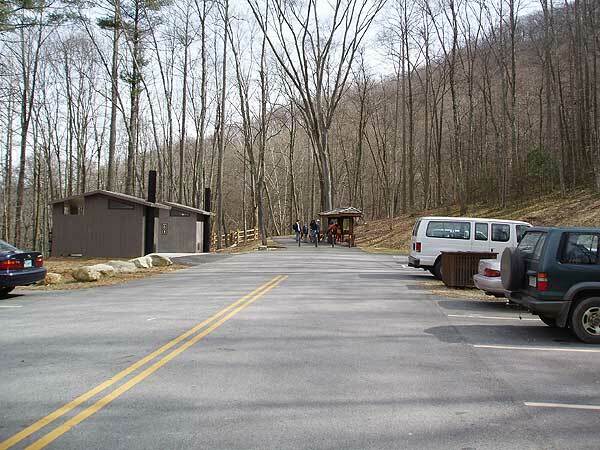 Mile 3.3 – Crabtree Falls Trail ends at the upper parking lot at the Crabtree Meadows campground. Go left on the forest road heading uphill towards the Appalachian Trail. Mile 3.4 – Pass by Crabtree Meadows, a large field at the headwaters of Crabtree Creek. The forest road climbs above the meadow passing by multiple campsites on each side of the road. 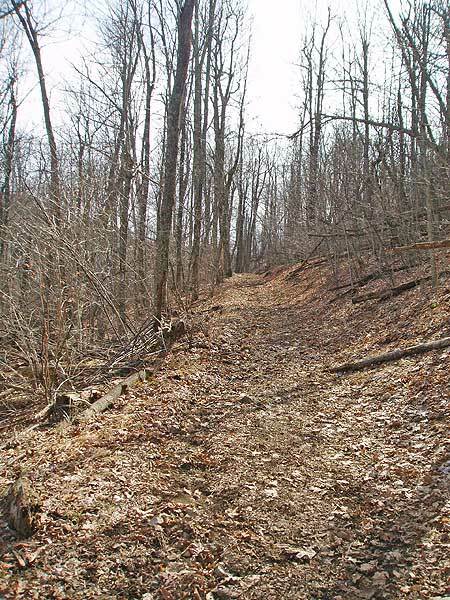 Mile 3.8 – Junction with Appalachian Trail (white blaze), turn right heading south. 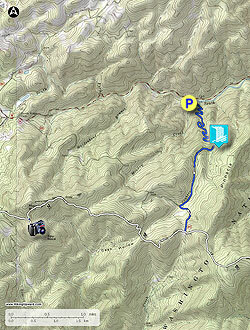 Mile 4.8 – Pass through a junction with an unmarked forest road to Cash Hollow. 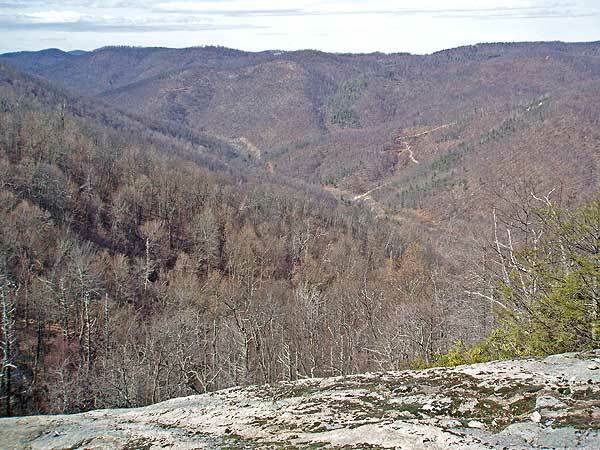 Mile 6.1 – The trail passes over a series of large rock faces that have open views to the southeast of Spy Rock and the peaks of the Religious Range. The rock face looks to be the result of a landslide. Mile 6.5 – A small campsite on right in a grass clearing. 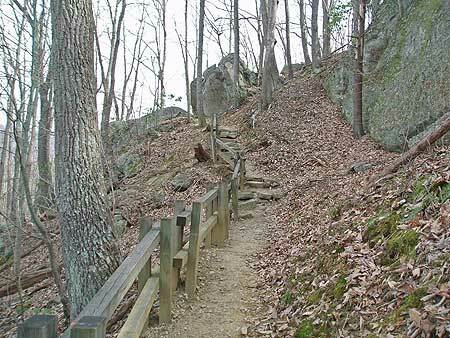 Mile 7.0 – Spy Rock Trail branches left away from the Appalachian Trail and passes through a very inviting sparse, flat forest with many campsites. Mile 7.1 – Reach the base of Spy Rock. There are no trails to the top and you will have to find scramble routes. The summit of Spy Rock is a huge rocky dome with 360° views. Due west Black Rock is clearly visible on the south side of Maintop Mountain. The southern view includes the Religious Range and Mt. Pleasant. The best view is arguably to the north of The Priest, Little Priest, and Three Ridges Mountain. The scramble down is tougher than going up. Pick your footing carefully. 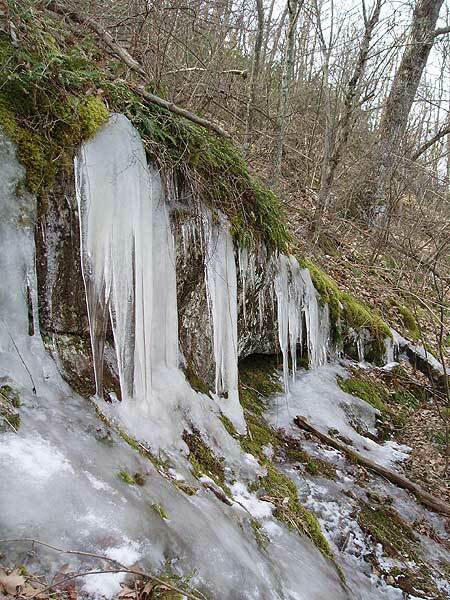 In the winter there are large patches of ice. Mile 7.3 – Turn right heading north on the Appalachian Trail. Mile 9.5 – Cross the intersection with the forest road to Cash Hollow and avoid the slight right on another forest road than wasn’t noticeable from the other direction. 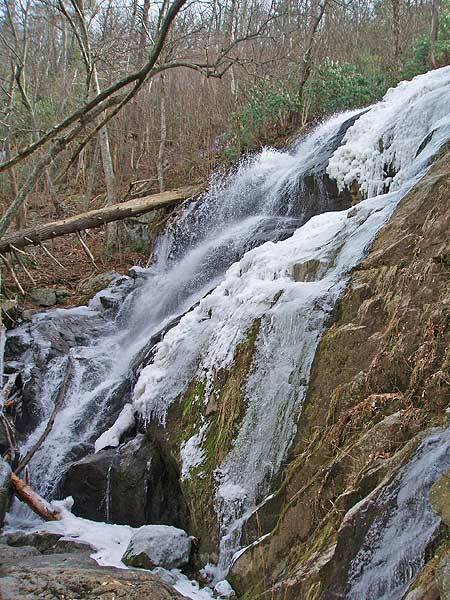 Mile 13.9 – Hike ends at the Crabtree Falls parking lot. We have hiked this one many times, and it is always a fun short hike (we do the 1.7 mile there and back). This is by far the best marked trail I have ever come across. Due to the ice storm in Nov 2018 there are currently some tree still down across the trail and a few parts washed out near the 1.6 mile mark. It looks like the park service is actively working on repairs they just haven't gotten up that far yet. They seem to also be rebuild a porch mid-falls. I'll be interested to see it when they are done. My 4 years was able to do this hike so, anyone can! Overall very nice hike, about 6 hours in length. 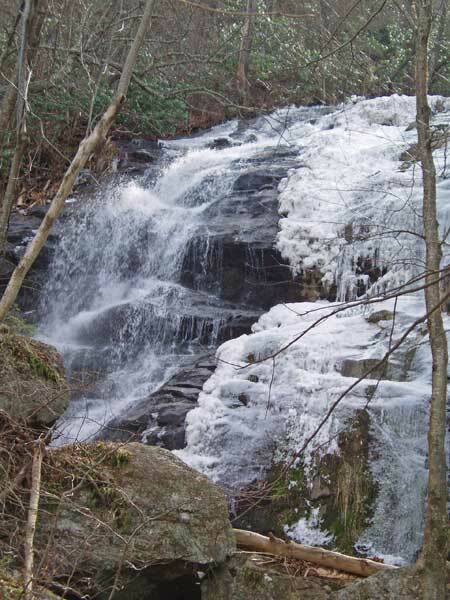 In winter, navigating the trail along the Crabtree Falls can be very tricky, as parts of the trail may be covered by ice. At the top of the falls, the trail continues on the right side of the creek (looking upstream, the bridge is on your left). Took me about 2 hours from the top of the falls to Spy Rock. There were multiple tents at the base of the summit boulder. There is no obvious way up the summit I scrambled over the rocks to the left of the trail leading to the base. Views from the top are superb!! I have heard this is a great trail to hike, and finally did it yesterday. Totally worth it, and the amount of rain in Virginia, the falls were really flowing. Besides the amazing views, I enjoyed the gentle switchbacks. Hopefully they will be cleaned up soon, but there was a major windstorm (according to the locals), and a lot of trees snapped or fell, including many over the trail. They are working on cleaning it up, but there are just so many, so be prepared for some going over or under trees that cross the trail. The trail is never completely blocked. Out and back to spy rock per direction, BUT the direction seems to indicate to stay on the AT till you reach the falls parking lot.This is an out and back on the same trail retrace your step to get back to your car. Scramble up spy rock is nice and the view is good, but lack of trail marker got me wandering around till find my way off the rock. ARGHH!